Deriving from the Greek word harmony and balanced universe, can the cosmos plant help me create a harmonious garden? Before I started to become interested in growing my own food and growing my own flowers, my gardening skills and creativity were a little slap dash. I would find a pretty flower I liked, order it in bulk and plant in my garden in straight lines. Now this may be simple, easy, and consumed very little time, but I definitely didn’t get the desired effect in my garden that I had wanted. Since taking on my allotment last year and scrolling through Instagram everyday seeing peoples pages full of produce and wonderful varieties of flowers, this year I have dived into taking on more variety and colour with my own flowers at the allotment and in my own garden. I hope to grow all of my own flowers from seed, as I know how rewarding it can be growing my own vegetables form seeds I hope it will be the same for my flowers. I am a complete flower novice, so when it came to planting some flowers at the plot in 2017 I went for what I thought might be easy to grow. Gladioli bulbs and the dahlia tubers caught my eye. To be fair they were pretty simple (following packet instructions) it all worked really well, popped them in the ground and the flowers did the rest. As soon as the flowers started to bloom they looked amazing and I soon knew I needed a bigger variety of flowers and colours for next year. So when I say flower novice I really mean it, here’s an example. I had around 30 gladioli bulbs to plant last year, I got to the last row and suddenly thought, should I be planting the bulbs a certain way round? Of course you should Kirsty, so what should have been a quick easy job involved me digging them all back up to check if they were the right way round! I suppose we all have to learn one way or another! After seeing all of the beautiful pictures of flowers over Instagram I found that the flower that caught my attention the most was cosmos. It seemed that even in the busiest garden boarders it stands out, yet it has the most gentle, natural look to it that it just seemed to draw me in. I decided that I wanted to include cosmos into my cutting patch at the allotment and my home border so these are the varieties I have to try. Sowing my cosmos seeds by following the instructions on the Mr Fothergill packets it says you can sow indoors from February onwards. I sowed my seeds into peat free compost, watered and placed on a sunny windowsill on February 23rd. The pack advised that flowers would germinate between 14-21 days but my seeds were popping through in just 3 days. After just 9 days most of the Cosmos seedlings are starting to produce their next set of leaves. Now the seedlings have sprouted I’m really hopeful that I can grow some beautiful cosmos flowers from seed, plus cosmos is supposed to be the easiest thing in the world to grow from seed. I am a little worried saying this I have set myself up for a disaster and I possibly now wont grow any flowers at all. I will keep my Instagram and twitter account updated with the seedlings progress and how they do over the spring and summer. I will also pop on a blog later in the year to document how they have done and to hopefully share all my beautiful pictures of the flowers and wonderful varieties of cosmos from the Mr Fothergill seeds. If you have any top tips for growing cosmos please leave a comment or get in touch. 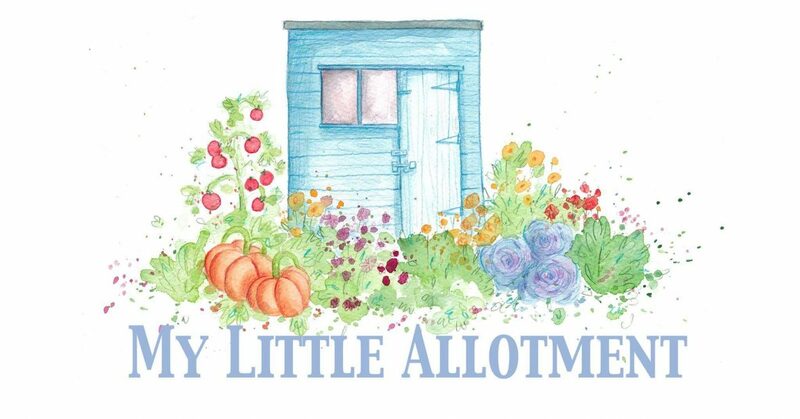 For daily updates about My Little Allotment please follow me over on Instagram and twitter. For more blog updates please subscribe or follow. Oh I love how you dug the gladioli up to check you has planted them correctly. Sooo something I would do! I’m growing these too! Also not a flower expert, but I like to have some (easy!) ones around for bees, colour and pollination.